More than 99% of our public seminar students say their new RCA skills are valuable and marketable, and would recommend the course to colleagues. We are also offering a third day of advanced training on March 1st - our RCA Analyst Level 2: Master Facilitator course provides expanded facilitation and program management skills. We look forward to continuing to serve your RCA needs, and to seeing you and/or your colleagues in class - register now! Clients tell us that when one of our students returns to work and completes just one RCA, the savings create an immediate 100% return on the training investment...and then some. This is your opportunity to build your RCA skills & recommend the course to others who must also deliver cost savings as well as improvements in quality, safety, IT, processes and reliability. In an effort to raise awareness that heart disease is the number one killer of women (it kills more women than all forms of cancer – combined! ), the American Heart Association (AHA) devised the Go Red for Women Campaign. National Wear Red Day is February 3rd, 2012! Even the popular new hit show Hot in Cleveland starring Betty White tackled this issue on a recent episode of the show (air date: 1/18/12 – you can watch the episode). While most women admit to worrying about breast cancer which affects thousands, many are unaware of the hundreds of thousands of women killed by heart attacks each year. Too often, women don’t realize that they are suffering from a heart attack; therefore, many don’t seek help until it is too late. In addition to the “classic” symptoms that men almost exclusively suffer (chest pain/pressure, shortness of breath, pain down the left arm possibly spreading to the jaw, neck and shoulders, nausea), women’s symptoms can also include indigestion, backache, dizziness and fatigue - not usually symptoms that would send us running to the emergency room! The AHA states that 80% of heart attacks in women can be prevented by making the right choices when it comes to diet, exercise (do) and smoking (don’t)! Visit http://www.goredforwomen.org/about_heart_disease_and_stroke.aspx for more information on how to fight cardiovascular disease and how to send 5 people you love (or at least like a little) information on heart disease with a free Go Red Heart Health Kit! You can also help raise awareness by “Liking” their Facebook page and, of course, by wearing Red on February 3rd! Women are dying at the rate of one per minute because they don’t know what you know: heart disease kills. Help spread the word! 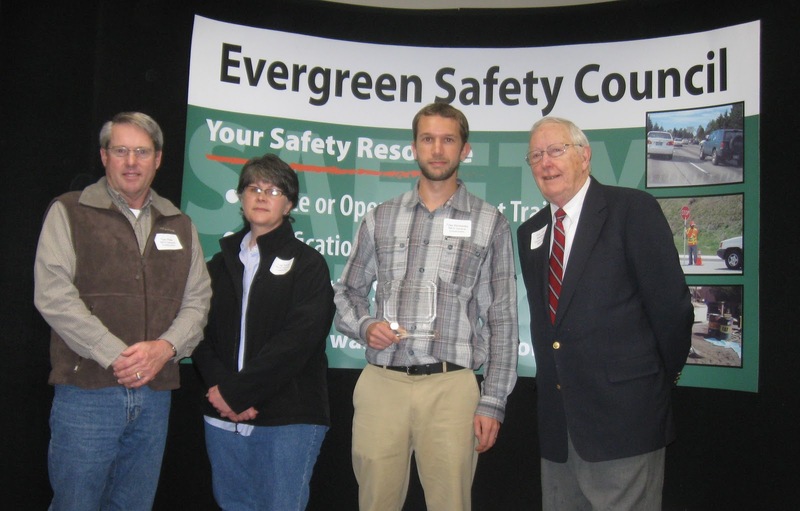 Why Should Your Organization be an Evergreen Safety Council Member? Be recognized for your organization’s safety achievements. Tell us about your safety efforts undertaken for the year, including examples of employee involvement and management commitment that helped foster a positive safety culture within your organization. Applications are being accepted until February 24, 2012. Any employee or family member of an AASC Safety Council or any individual, whose parent, or legal guardian, is employed at an AASC Safety Council for a period of not less than twelve months. Any member or family member of an AASC Safety Council who has been a member of not less than twelve months. How often do I need to...? LNI visited me, what do I do about…? How do I make a plan to...? I'm the new Safety Manager, how do I...? Does the ESC have training on...? Winter is upon us, so it’s time to take a look at driving in that white stuff - snow. 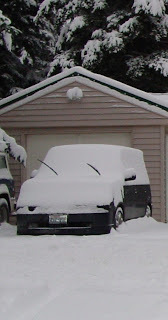 Before you drive off after a snowfall, take a few minutes to make sure you can see, and that you can be seen by others. Not only is this common sense, it's the law. 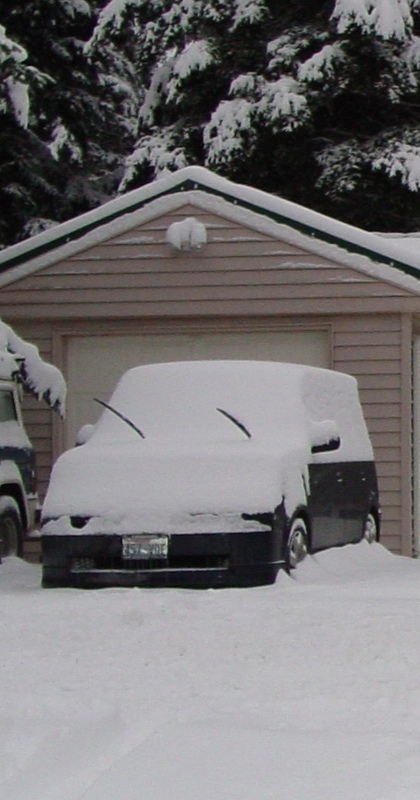 You can be fined for driving with the windows covered in snow or ice. Clear all the snow off the hood, windows, trunk and all lights. You don't want snow flying off the hood and back onto the windshield, blinding you. Of course, de-fog the windows before driving, and always drive with your headlights on. Obviously, the lack of traction is the biggest challenge in snowy driving conditions. If you drive a rear-wheel-drive vehicle, you may be able to help its forward traction a little by adding weight to the trunk. However, if you do get into a rear-wheel skid, the extra weight increases the centrifugal forces once the car begins to slide - just like a pendulum - possibly making matters worse. So, if you put extra weight in the trunk, place it as far forward as possible - preferably right over the rear axle. And please don't add weight to the rear of a front-wheel-drive car. It not only won't help, it's dangerous. Getting stuck in deep snow may be one of the most frustrating situations you ever face in the winter. Generally, it's not dangerous, just annoying. The first objective is to avoid getting stuck in the first place by trying to keep up your momentum. Once you stop in deep snow, your chances of getting going again are reduced. Try to keep the car moving at all times, even if it means just crawling along at a couple of kilometres per hour. In fact, don't carry too much momentum, because your stopping power is much reduced as well. If you do get stuck, don't just sit there spinning your wheels. All that does is create an icy patch under the tires, which will make it even tougher to get out. Instead, turn off the radio, the heater fan and windshield wipers, open your window and really listen for any spinning of the tires. Before you even try to get going, though, get out of the car and clear as much snow as possible away from right in front of the tires. If possible, put some sand, kitty litter or even some old carpet (keep this "winter traction kit" in the trunk along with a small shovel, candles, matches, a drinking cup and non-perishable food) down in front of the tires to give them some traction. Give them a chance to get moving - to get some momentum - before having to plow through the deep snow again. If you still can't get moving, your next objective is to rock the car backwards and forwards until it has enough momentum to get out of the snow rut. In an automatic, quickly but smoothly shift from Drive to Reverse and back again, trying to stay in sequence with the rocking of the car. In a standard transmission vehicle, gradually start forward then immediately release the clutch, allowing the car to roll back. Then ease the clutch out to move forward again to the front of the rut, then release the clutch and roll back. Do this until the car has the momentum to drive out of the rut. Use the highest gear possible in an automatic - Drive or Overdrive. In a standard transmission vehicle, try starting in second gear. You may even want to shift up to third and fourth gear earlier than you normally would. Using a higher gear will cause less wheelspin. Now that you've got your vehicle moving, keep it under control until we look at controlling a car in snowy conditions in a future column. Now that we've got it going, let's look at keeping it under control in the snow. First, take it easy when crossing snow-covered intersections. The snow usually becomes packed, polished and very slippery from drivers skidding and sliding at the stop sign or traffic light. Be very careful when driving in ruts in the snow, as they can pull your car from side to side, or into on-coming traffic. Always look where you want to go, not where you don't want to go. This will automatically make you steer in the direction you want to go, helping control the car's tendency to follow the ruts - which may not be where you want to go. Also, be careful if your car pops out of the rut, especially if your front wheels are turned. Jumping, or popping, out of a rut with the wheels steered sharply to the left or right usually tends to make the car skid sideways. Again, look and steer where you want to go, turning the steering as little as possible. If you have to change lanes on a snowy road, be very smooth with your steering and don't accelerate or decelerate. As long as you keep steady - turning the steering wheel as little as possible - driving gently with your speed not too high, you shouldn't have much to worry about when crossing the deep snow and ruts between the lanes. Often, the tracks, or ruts, made by other vehicles are packed hard and are much icier than the snow next to it. Try to avoid having to brake in these ruts. You will be able to stop much quicker in deep snow, as it will build up in front of the tires, helping stop your car. Try to do only one thing at a time. Do your braking before a corner in a straight line, then take your foot completely off the brake pedal before you steer around the corner, and don't begin accelerating until you are pointing straight ahead again. So, whether you're sliding towards a ditch, another car, a telephone pole or whatever, don't look at it. Don't focus on where you could crash. Instead, look and steer where you want to go. That's your best chance of controlling a skidding vehicle. Before just blindly attacking a snow covered hill, think about whether you can make it up or down safely. Often, that means waiting until the road is clear of other vehicles before attempting it yourself. Too many drivers attack hills while there are other vehicles stuck or spun sideways on it, only to have to stop or slow to let them get out of the way - and getting stuck themselves. It would be much better to wait until the hill is clear, and then drive it all in one shot. When driving up a hill, or trying to get out of deep snow, try using as high a gear as possible. In an automatic, use Drive or Overdrive. In a standard transmission vehicle, use one gear higher than you normally would - try starting in second and then use third or fourth when climbing a hill. One last thing. Watch your speed in snowy conditions, especially when coming off a clear major roadway onto a snowy side road. The quick change in conditions can really take you by surprise. On July 25, 2000, Andrew York was struck and killed by a drunk driver while working in Sunnyslope as a Journeyman Lineman for Chelan County PUD. To honor Andrew’s memory, employees of Chelan County PUD have established the Andrew York Memorial Scholarship Fund. The scholarship supports graduating seniors from any high school in Washington State who have been active in the community, specifically in preventing drug and alcohol abuse. The scholarship is administered through the Community Foundation of North Central Washington . Applications are being accepted until February 15, 2012 and can be downloaded from the NCW Community Foundation website. The New Year is here! If you are like most people, you may have even made a few “resolutions”. Studies show that 40-45% of Americans make resolutions every year, and at least one of those usually involves a promise to eat healthier and exercise more. Even though health related resolutions are made with the best of intentions, they often fail because people try to do too much too soon. (Certainly, if you attend the gym regularly, you notice the new crop of attendees every year that tends to dwindle after the first month or two.) People make promises to themselves that they are just not mentally prepared for or physically able to keep. While failure to keep these health related promises is disappointing, it also has the potential to be very dangerous or in rare cases, deadly. For those with cardiovascular disease, high blood pressure, diabetes, or for anyone embarking on a new fitness program after being sedentary, it is imperative that before you begin any diet or exercise program you visit your physician to get medical advice and physical clearance. No one disputes the advantages of physical fitness. The trick is to start slow and make attainable goals. In general, to achieve maximum benefits, you should gradually work up to an aerobic session lasting 20 to 30 minutes at least three to four times a week, but even just walking for 20 minutes a day has been shown to strengthen your heart and cardiovascular system, improve your circulation and help your body use oxygen more efficiently. If you are planning to turn your health around this year by starting a diet and exercise program, please begin safely by visiting your physician to discuss the proper course of action for you! Stay safe and healthy in 2012! Winner gets $1,000 and trip to NY City to work with award-winning director to turn concept into professional PSA for national broadcast. NEW YORK, Jan. 5, 2012 -- The non-profit National Road Safety Foundation (NRSF) and Scholastic, the global children’s publishing, education and media company, are looking for ideas from young people to help convince their peers of the dangers of distracted driving. Entries open Jan. 7 for the 3rd annual Drive2Life PSA Contest. The winner will receive a $1,000 prize and an expenses-paid trip to New York to work with an award-winning TV director to turn his or her idea into a public service message that will be broadcast nationwide next May during Global Youth Traffic Safety Month. "Traffic crashes are the leading cause of death among U.S. teens, with 5,000 killed annually," said Michelle Anderson of The National Road Safety Foundation, a non-profit group that produces driver safety materials that it distributes free to schools, police and traffic safety advocates. "Distraction is a major factor in many teen crashes, so we are encouraging young people to help us get the word out to their peers via television and the internet." Students in Grades 6 - 12 are invited to submit a PSA concept that addresses, in 30 seconds to as long as two minutes, the dangers of distracted driving. Ideas may be in the form of scripts, storyboards or treatments. No video will be accepted, and group entries are not accepted. The creator of the winning PSA concept, judged by a panel of education and traffic safety experts and an award winning film director, will receive a $1,000 prize and an expenses-paid trip to New York City to work with the director to film and edit the idea into a professional PSA. Two runners-up in each grade category (Grades 6-8, 9-12) will each receive $500. The winning PSA will be broadcast in May on more than 220 TV stations nationwide on the nationally-syndicated Teen Kids News. It will receive widespread airings on newscasts and online. The winner will also be profiled in Scholastic classroom magazines, which are used in classrooms by more than three million students and nearly 40,000 teachers. "Distracted driving is a dangerous epidemic on our roadways, and teens are among the most at risk," said U.S. Secretary of Transportation Ray LaHood." It's critically important for young drivers to get the message that even one text or call could have devastating consequences. This PSA contest is a creative opportunity for young people to promote safe driving in their communities and encourage their peers to put down their cell phones when they're behind the wheel." A 16-year old Arizona high school student, Bethany Brown, won the first Drive2Life PSA Contest, with a 30-second spot titled, "There are no re-do's in real life." The winner in 2011 was 15-year old Lauren Daniels of Oswego, N.Y., whose spot used humor to get across the message, "Distracted Driving. Not funny." "We were impressed with the excellent ideas we saw the past two years," said Sec. LaHood. "We look forward to seeing more great ideas from creative young people that will help make the risks of distracted driving resonate with their peers." Visit National Road Safety Foundation (NRSF) or Scholastic for more information about the competition and for the entry form and complete rules. Deadline for entries is Feb. 29, 2012. For nearly 50 years, the National Road Safety Foundation has created driver education programs and distributes them free to schools, police, traffic safety agencies, youth advocacy groups and others. NRSF has programs on distracted driving, speed and aggression, drinking and driving, and drowsy driving. October 22, 2011 - An employee of a self storage unit was stabbed and killed while performing his usual work duties. September 28, 2011 - A worker who was hanging sheetrock, was stung by a bee and died. September 15, 2011 - A worker died in a 10 car motor vehicle accident. August 18, 2011 - A worker surveying fish was found unconscious face down in the water. August 12, 2011 - A worker was stung by wasps or hornets and died due to venom. June 6, 2011 - A worker was caught and crushed between a protruding door on the shovel and a stump. February 19, 2011 - A worker was caught between two tractor trailers as one was pulling out of a designated parking area. The list does go on, and if you would like to see the complete list it can be found on L&I’s web site. The point is that 43 on-the-job fatalities is 43 too many. In some of the cases it was just an accident, but in others it was poor training and poor safety programs. It is imperative that employees receive training on the hazards that they face on the job. This can be anything from working around heavy equipment to protecting oneself from workplace violence. It is also important that every employer determines what hazards their employees face and how they can be protected from these hazards by appropriate training and/or PPE and the like. We at Evergreen understand that these can be daunting tasks, but also understand they are extremely important to do. If you need to develop and/or update your company's safety programs or training, please email me or give us a call 800-521-0778. Is your organization a member of ESC? In addition to the Monty C. Lish and Stanley O. McNaughton Scholarship for Safety & Health Careers, ESC member company employees qualify to apply for the "$500 American Association of Safety Councils Scholarship"
■Any employee or family member of an AASC Safety Council or any individual, whose parent, or legal guardian, is employed at an AASC Safety Council for a period of not less than twelve months. ■Any member or family member of an AASC Safety Council who has been a member of not less than twelve months. The scholarship applicant must be a full-time student in the sophomore level or higher at an accredited college or university. The person must have a 2.75 GPA or higher and will be selected by the Scholarship Committee based on involvement in community/school organizations, leadership positions held, awards received and a strong emphasis will be placed on a submitted essay relating to how safety and health are important in their life and/or career. Application deadline is March 12, 2012 to be considered for the 2012 American Association of Safety Councils Scholarship.